We&apos;ll be painting the town -- and the river -- green this weekend in Tampa Bay! The luck of the Irish takes over downtown with a family-friendly St. Patrick’s Day festival in Curtis Hixon Waterfront Park. There&apos;ll be local Irish dancing, kids activities and local food vendors. The beer will be green. So will the Hillsborough River. In the spirit of St. Patrick, the city will collect food to help the Salvation Army carry out its mission of helping the needy. A tent at the park will be set aside for food donations. After spending the afternoon at the Mayor&apos;s River O&apos; Green, join the crowds on Seventh Avenue in Ybor City for the annual Rough Riders St. Patrick&apos;s Day parade. Teddy Roosevelt slept here on his way to San Juan Hill during the Spanish-American War, and Tampa&apos;s Rough Riders community group keeps the memory of TR alive through its good works. Those who want to get a jump on St. Paddy&apos;s Day, can join the Rough Riders on their Trolley Hop restaurant crawl through Ybor City from 6 p.m. to midnight on Friday. Opera Tampa celebrates its 20th anniversary by bringing Puccini’s masterpiece to life at the Straz Center for the Performing Arts’ Morsani Hall. Set in early 20th Century Japan, the opera tells the story of American Navy Lt. Pinkerton, the geisha he marries and the tragedy that ensues. 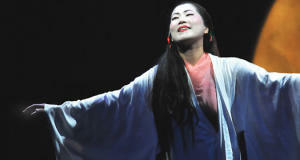 Soprano Yunah Lee debuts as the title character. The performance is in Italian with English superscripts. Whether you fly like an eagle or ride a big ol&apos; jet plane, you should take the money and run to Tampa Bay’s MidFlorida Credit Union Amphitheatre with two of the most celebrated bands of the 1970s and 1980s share the stage. Don’t stop believin’ that this show will be done any way you want it.